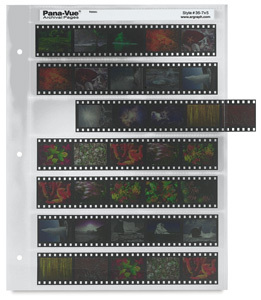 Pana-Vue Archival Pages are archival-quality, acid-free holders for prints, negatives, and slides. Designed to fit in three-ring binders and hanging files, they make it easy to view and store your images while protecting them from fingerprints, scratches, and dust. Holds seven 5-frame 35 mm strips, for a total of 35 frames. ® Pana-Vue is a registered trademark.